Bucktown, one of Chicago's trendiest neighborhoods, welcomed a new, high-end apartment complex in May 2017. Centrum Bucktown is a six-story, 100-unit building with a gleaming façade wrapping the corner of North Leavitt Street and North Milwaukee Avenue. Designed by Hirsch Associates and Forum Studio, the project is pursuing LEED® Silver certification through the U.S. Green Building Council. Contributing to the attractive building, as well as its sustainability and performance, Northern Glass installed Tubelite's Therml=Block® TerraPorte 7600 Series terrace doors and 900RW Series ribbon window, plus Phantom 5000 vents. Centrum Bucktown is the first project to showcase all three of these Tubelite products, which have been introduced to the U.S. market during the last 18 months. "Now, when we're looking at 10-, 12- 15-story buildings, we can use Tubelite's 900RW on the upper floors, the Phantom vents and terrace doors throughout, and storefront on the first floor," says Eric Martinson with Northern Glass. "We have a complete package. It gives us the option to do more and go higher on projects like Centrum." With the flexibility of this product breadth, Martinson reveals, "It's changed the way we work. By pre-glazing about 90 percent of the system in our shop, we cut down on the time and labor in the field." He estimates this savings as high as 25 percent. "Tubelite's 900RW is now our favorite system to install." Mary Avery, Tubelite's vice president of marketing, adds, "This project offers a great example of how 900RW ribbon windows save installation time and labor, while meeting model energy codes and supporting LEED certification." For Centrum Bucktown, Tubelite's Therml=Block terrace doors and ribbon windows are thermally improved by Linetec using a poured-and-debridged process. 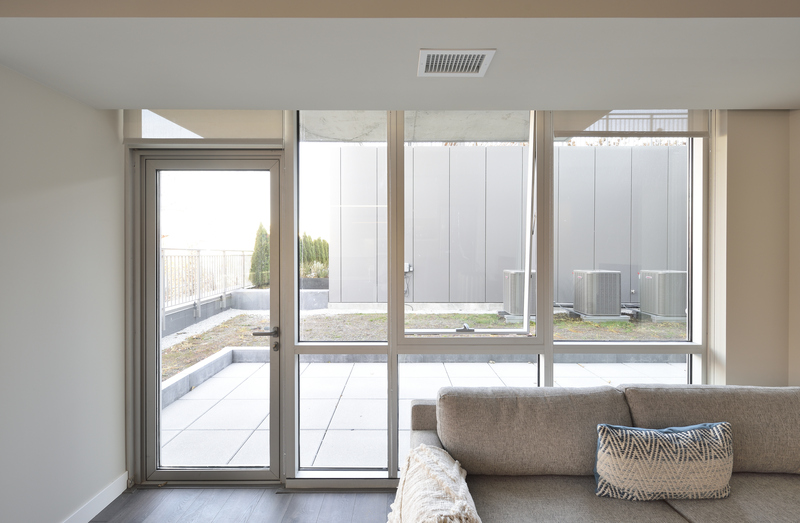 Avery notes, "Even during Chicago's tough winters, our Therml=Block products provide thermal performance and condensation resistance, contributing to the project's energy efficiency, natural light, outdoor views and interior comfort." Martinson agrees, "Tubelite's products exceeded the project's performance requirements." Tubelite's 900RW dual poured-and-debridged ribbon window system has been successfully tested per the National Fenestration Council (NFRC) 102-14 procedure, achieving a U-Factor of 0.30 for thermal transmittance. The system also successfully was tested per the American Architectural Manufacturers Association (AAMA) 1503-09 standard, achieving a frame condensation resistance factor (CRFf) of 72. The single and dual thermal break options allow designers to select appropriate thermal performance levels to meet their projects' requirements. 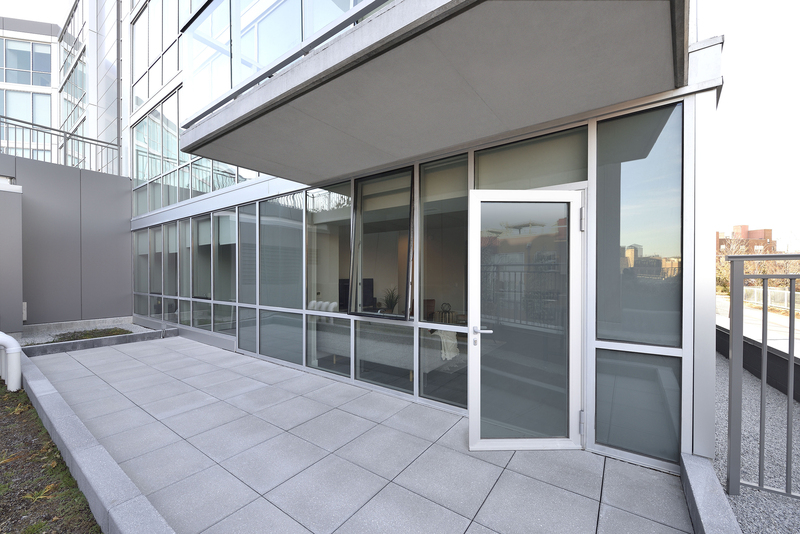 In addition to contributing to energy efficiency, daylight and views, TerraPorte doors and Phantom vents allow for natural ventilation during Chicago's warmer months. With sizes extending up to 12-feet-tall, TerraPorte 7600 terrace doors achieve AAMA AW-70 Architectural Performance Class requirements, which includes stringent criteria for air, water and structural performance plus AAMA 910-16 lifecycle testing to 4,000 operating cycles, with supplemental thermal cycling. Multi-lock hardware is standard on TerraPorte doors and low-profile accessABLE™ sills may be specified to achieve universal design goals. The doors' heavy-duty aluminum hinges, along with corner key and crimped construction, provide increased durability for frequent use. Also AAMA AW rated and NFRC tested, Phantom vents' hinging options allow opening from the bottom or side of the window. Their concealed aluminum frame design is virtually invisible from a building's exterior, providing a consistent appearance. Enhancing this appearance, Linetec provides one the most durable finishes for architectural aluminum products – Class I clear anodize – on all of Tubelite's systems for Centrum Bucktown. Linetec's anodize finish also supports environmentally responsible practices and design-forward thinking. It creates a frosty matte appearance, contains no VOCs and meets or exceeds all AAMA 611 specifications. When it is time for the installed architectural product to be removed, anodized aluminum is 100 percent recyclable, lending itself to post-consumer recycled content during demolition or restoration of the building. Tubelite's products are manufactured to meet the aesthetic, performance and environmental goals of each project. Demonstrating its dependability and partnership, Tubelite's Damage Free Guarantee ensures orders are delivered undamaged, complete and on time for easy fabrication and installation. Both Phantom vents and TerraPorte doors are engineered for simple integration with Tubelite's 900RW ribbon windows. 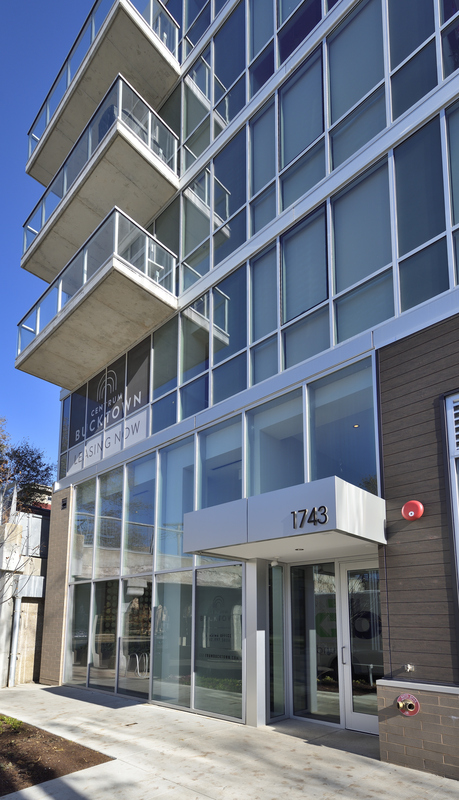 Today, Centrum Bucktown's daylight-filled apartments are available for lease. Studio, one-, two- and three bedroom apartments, as well as tenant amenities are on the second through sixth floors. Each features high-end fixtures and finishes, and such shared amenities as a resident lounge, cyber café, fitness center and expansive outdoor terraces. A new, remodeled ALDI store now anchors Centrum Bucktown's first floor, along with a new location of the Yolk breakfast restaurant chain. 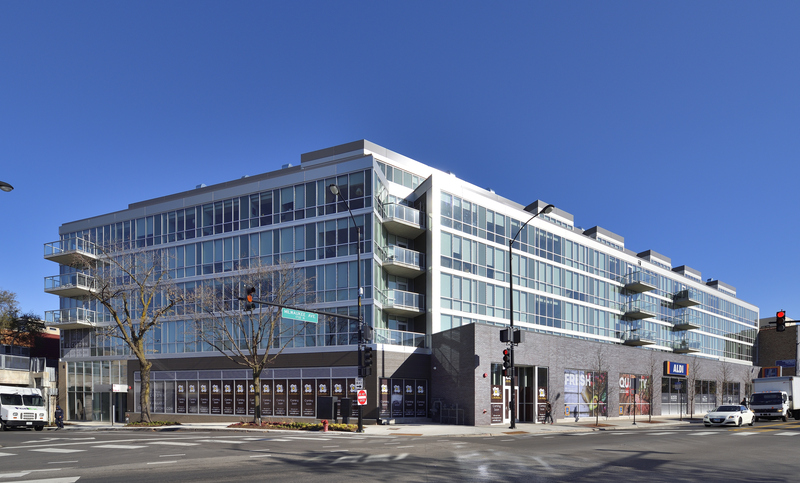 Originally known as Centrum 606 due to its proximity to the popular elevated "606" walking and biking trail, Centrum Bucktown provides convenient access to downtown as well as nearby parks, recreation, shops and restaurants. A surface parking lot for retail customers, electric vehicle charging stations and underground parking for residents add convenience for those not already taking advantage of nearby public transportation and pathways. Tubelite's corporate office, fabrication, warehouse and shipping operations are located in Walker, Michigan. Its Dallas location provides additional fabrication, warehouse and shipping operations and its facility in Reed City, Michigan, houses the company's aluminum extrusion operation. The company also has offices in Rock Hill, South Carolina, and Warwick, Rhode Island.